This image from the Heald Commission Report shows the projected need for skilled and college -educated workers in its argument for additional colleges. Upon his election as governor in 1959, Nelson Rockefeller established a committee to examine the expected increase in demand for higher education in New York in the coming decades. The committee, chaired by Henry Heald, issued this report calling for an expansion of the SUNY system as well as public aid to private colleges, increased student scholarships, and an end to the tuition-free policy in New York City's municipal colleges. 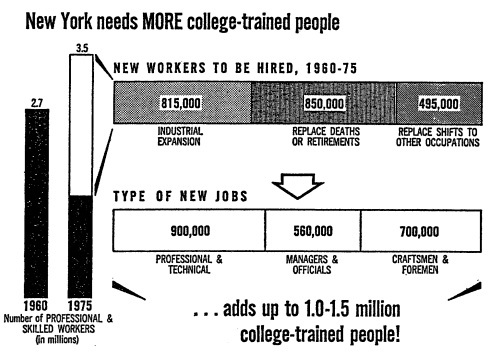 Cite This document | Committee on Higher Education, “"New York needs MORE college-trained people" (from Heald Commission Report),” CUNY Digital History Archive, accessed April 26, 2019, http://cdha.cuny.edu/items/show/2862.